For the Chicken: In a large zip-top bag or shallow baking dish, cover and soak the chicken breast in the buttermilk and salt and refrigerate for 8-24 hours. Line a baking sheet with a baking rack. Line a plate with paper towels. In a large bowl, whisk together the 2 cups of flour, 3 teaspoons of seasoned salt, 2 teaspoons garlic powder, 1 teaspoon black pepper and 1/4 teaspoon of cayenne pepper. Toss the chicken breasts in seasoned flour and remove to prepared baking sheet and set aside until ready to fry. In a large Dutch oven or tabletop deep fryer, add 1-2 inches of oil. Preheat oil to 350ºF. Working in batches, fry chicken breasts until golden brown and the internal temperature reaches 165ºF, about 6-8 minutes. Remove to prepared plate. Repeat with remaining amount of chicken. When cool enough to handle, slice into strips. For the Quesadillas: In a large bowl, whisk together the remaining flour, seasoned salt, garlic powder, black pepper and cayenne pepper, and set aside. Fill a shallow baking dish with buttermilk and set aside. Place 1/2 – 3/4 cups of chicken strips onto one half of a tortilla. Top with 1/2 cup of shredded mozzarella, 2 tablespoons of ranch, and 2 teaspoons of buffalo wing sauce. Fold tortilla, dip in buttermilk, dip in seasoned flour and repeat. Fry, securing with toothpicks if necessary, in the same preheated oil, for about 2 minutes or until golden brown. Slice quesadilla into fours. 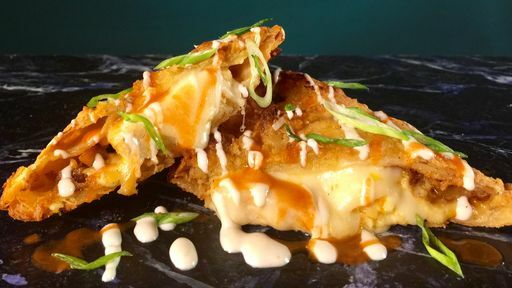 Top quesadilla with ranch dressing, buffalo wing sauce, and chopped scallions, and serve. Tip: If the filling oozes out of the tortilla into the oil, secure the tortilla closed with toothpicks before frying.